The Fontan Operation was first performed in 1968. Since that time, it has undergone a series of modifications and has become the standard treatment for patients with single ventricle defects, in which there is effectively only one pumping chamber in the heart. Statistically, surveys of past Fontan patients have shown that nearly 90% survive for at least 5 years after the procedure, and nearly 80% live for 10 years or more. The prognosis improves with the more recent forms of the operation, which reduce the incidence of arrhythmias. Some of the other difficulties that may arise with time in the Fontan survivor include ventricular dysfunction, atrioventricular (mitral or tricuspid) valve regurgitation, and obstructions to blood flow in the vessels or heart chambers that were modified by the procedure. Besides the potential cardiac problems, the enlargement of a patient's liver may be caused by high venous blood pressure. Among late Fontan patients, 10-15% develop a condition known as Protein-Losing Enteropathy (PLE), in which protein is lost through the gut. This is a very serious condition, the cause of which is unknown. It results in fluid retention and internal bleeding. Treatment generally involves the use of diuretics such as spironolactone. In severe cases, a heart transplant may be necessary. PLE generally disappears after a successful transplant is performed. It is important that the Fontan patient receives regular physical examinations so that any changes are discovered and treated if possible. In cases where obstructions occur, the cause may be corrected through surgery, or through the placement of a stent. 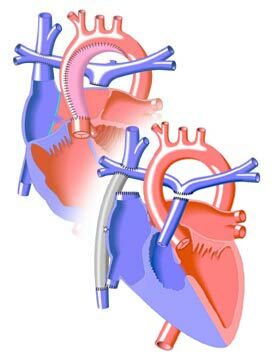 Valve repair or replacement may be necessary in cases where the mitral or tricuspid valve function breaks down. Because of the slow flow of blood through the Fontan connection, patients are at risk for pulmonary emboli (clots). This is particularly true in patients with the classic Fontan as they typically have a very dilated right atrium. All adult patients should be treated with blood thinners, such as aspirin, or with anticoagulants such as warfarin. As the Fontan has been performed for a relatively short period of time, its long-term effects are poorly known. It is expected that acquired heart diseases such as coronary artery disease and cardiomyopathy would pose special risks to the Fontan patient, making the maintenance of good overall physical health and diet imperative.